Each person with Multiple Sclerosis differs from every other. Help spread the awareness of MS by proudly wearing this Multiple Sclerosis Jewelry. The brightness of the ribbon shows hope so people with MS can live a full and happy life. Showing your support with this Awareness Dog Tag is just one step closer to helping families that need us the most. Our Multiple Sclerosis Awareness Ribbon Dog Tag measures 1.125” x 2” on a 30” Beaded Necklace. Each MS Ribbon Dog Tag is great for showing your support. I ordered these for my kids and they feel very special to have something "cool" that represents mommy. I wish I could have my name and when I was diagnosed on the back of it. If so...I would buy it. Very pleased with my MS Awareness Dog Tag. Wear it with my military dog tag daily. Thank you for the products and support. Additional Info Wear this MS Awareness Dog Tag to help educate everyone about the diversity of the people and families living with this condition. Each Dog Tag shows your continued support in funding research and makes the best Personalized MS Awareness Walk Even Accessory. 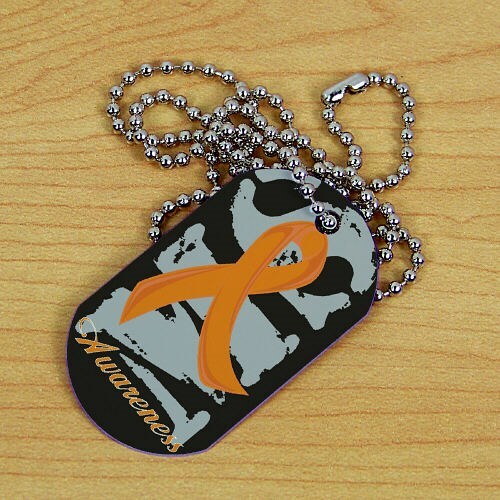 MS Awareness Ribbon Dog Tags also look great with our Multiple Sclerosis Athletic Department T-Shirt and our I Wear Orange MS Hat For every purchase made, MyWalkGear.com will donate a portion of its proceeds to help people and families living with this condition.